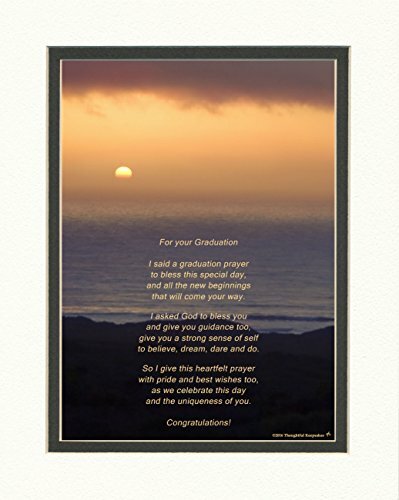 Graduation Gift with ''Graduation Prayer Poem'' Ocean Sunset Photo, 8x10 Double Matted. A Special Keepsake Gift for Graduate. Unique High School or College Graduation Gifts. by Graduation Gifts at HoldUp Art. MPN: unknown. Hurry! Limited time offer. Offer valid only while supplies last. This is a special graduation keepsake and unique High School or College Graduation Gifts. It will be the graduation gift remembered and cherished. This is a special graduation keepsake and unique High School or College Graduation Gifts. It will be the graduation gift remembered and cherished. This photo of a beautiful ocean sunset includes the poem: For your Graduation (above poem) I said a graduation prayer to bless this special day, and all the new beginnings that will come your way. I asked God to bless you and give you guidance too, give you a strong sense of self to believe, dream, dare and do. So I give this heartfelt prayer with pride and best wishes too, as we celebrate this day and the uniqueness of you. (below poem) Congratulations! This gift celebrates not only the achievement and special occasion but more important the unique individual. If you have any questions about this product by Graduation Gifts, contact us by completing and submitting the form below. If you are looking for a specif part number, please include it with your message.